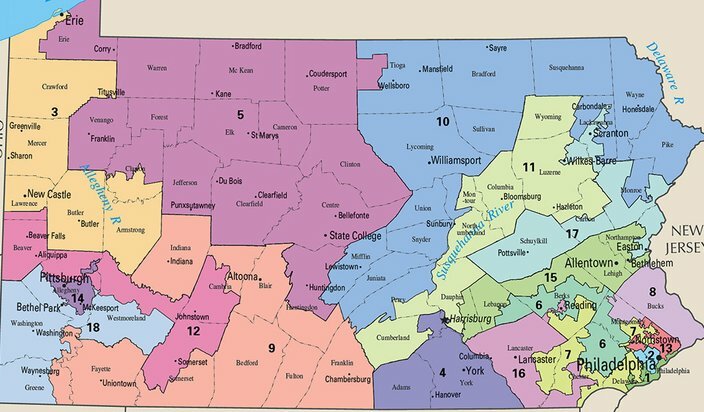 The Pennsylvania Supreme Court has unveiled its remedial plan to address gerrymandering in the state's congressional districts. Here is the map released Monday with the new districts. 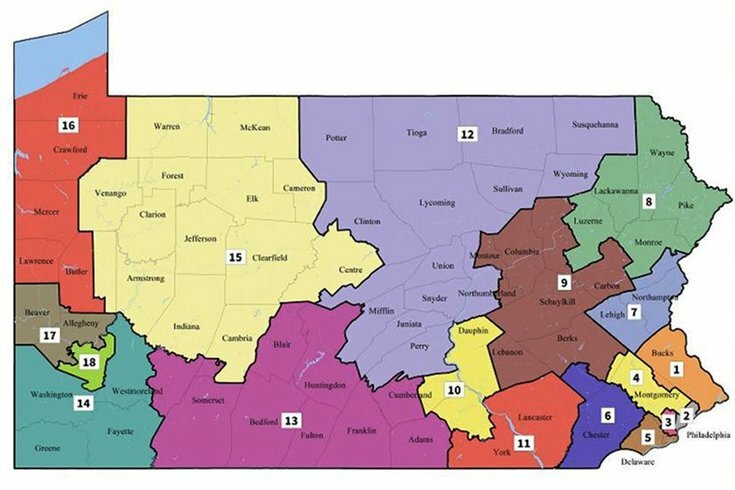 The Pennsylvania Supreme Court on Monday unveiled a new congressional district map to be used in the upcoming elections this year. The court imposed the new map after ruling the 18 current districts were gerrymandered in violation of the state constitution to give Republicans an unfair advantage. The new map is expected to improve Democratic prospects for a number of seats and lift the party's chances to take control in the U.S. House, the Associated Press reported. Republicans are expected to appeal the ruling, having argued the Supreme Court usurped power given to the state legislature. Monday had marked the court’s own deadline to make public the new district boundaries, which will be used for the May 15 primary. The new map splits 13 counties. Four are split into three districts and nine are split into two. "It is composed of congressional districts which follow the traditional redistricting criteria of compactness, contiguity, equality of population, and respect for the integrity of political subdivisions," the court ruled. The previous map, shown below, split 28 counties. This boundaries in this map of congressional districts in Pennsylvania have been used since 2013. Gov. Tom Wolf, a Democrat, issued a statement saying he respects the court's remedy. "Pennsylvanians are sick and tired of gerrymandering, which perpetuates gridlock, alienates citizens and stifles reform," Wolf said. The new map brings considerable changes to the districts that comprise Southeastern Pennsylvania. The redrawn First Congressional District, which previously encompassed portions of Philadelphia and Delaware County under Democratic Rep. Bob Brady, now includes all of Bucks County and a sliver of Montgomery County, including Lansdale and Hatfield. Most of that area was in the current Eighth district, represented by Republican Rep. Brian Fitzpatrick. The newly-drawn Second District is entirely in Philadelphia, encompassing Northeast Philadelphia, the river wards and portions of North Philadelphia that lie east of Broad Street. In the old map, many of those areas comprised the 13th district under Democratic Rep. Brendan Boyle. The Second District previously contained portions of Center City, West Philadelphia, Northwest Philadelphia and a section of Montgomery County under Democratic Rep. Dwight Evans. But those areas – with the exception of the Mongtomery County portion – now make up most of the Third district. On the old map, the Third district was in Western Pennsylvania. The Fourth Congressional District now includes virtually all of Montgomery County, save for a sliver that includes Lansdale and Hatfield, and another section along the Main Line. It also includes a small portion of Berks County. On the old map, Montgomery County was split among four different districts. Under the new map, there would not be an incumbent lawmaker. The Fifth District now includes all of Delaware County and portions of South Philadelphia and Southwest Philadelphia. Republican Rep. Pat Meehan would be the incumbent, but he has said he will not run for re-election. Meehan's current seat – the Seventh Congressional District – was considered among the most egregious gerrymanders, including portions of Berks, Chester, Delaware, Montgomery and Lancaster counties. The Sixth District now includes all of Chester County and a portion of Berks County, including the city of Reading. That district would remain under incumbent Republican Rep. Ryan Costello. Under the old map, Costello's district includes portions of Chester, Montgomery, Berks and Lebanon counties. In January, the Democratic-majority state Supreme Court ruled that the old map, used since 2013, put partisan interests above neutral line-drawing criteria. The decision split down party lines. The court ordered the Republican legislature and Wolf, a Democrat, to draft a new set of maps. If they failed to do so by the given deadline, the court ruled it would draw up new lines.